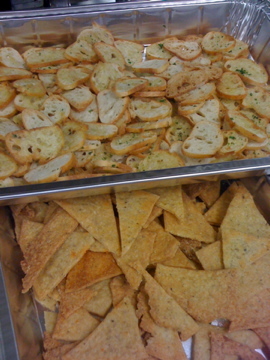 The baguette chips and spicy cheese crackers I made. You're welcome. Friday night, I had blisters on my hands, sore feet, cramped up legs and a knotted back…and I was happy as a lark. I got to cook all day for the Eggshibition, an annual fundraiser held for Youth Home in Little Rock. Pulaski Technical College Arkansas Culinary School was the caterer, so to speak, and I volunteered to help cook and work the event. Other than making crackers, I helped slice and skewer the duck, helped pack and load the vans to the venue (at University of Arkansas at Little Rock’s Jack Stevens Center), helped set up the lavish cupcake and cream puff table, and generally ran like crazy the later the night went. At some point I threw on my proper chef’s hat (was previously wearing a net, since my hat is really a tad small), without checking my hair. Not the extended beauty prep I used to do going to these sort of events in my PR days! 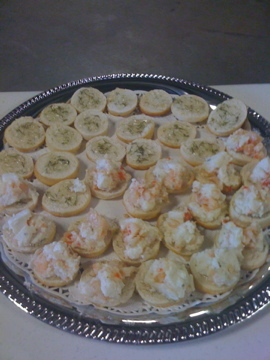 During the event, I spent most of my time making new appetizers as the crowd devoured them. The teeny shrimp and grits with fennel jelly on a teeny biscuit, being assembled. My station ended up being out in a hallway, making these tiny little shrimp and grits on a tiny biscuit with fennel jelly. Nice. Although we had plenty of volunteer help whose job it was to serve the goods, I snuck out to disperse a couple trays myself. It was fun seeing some of my old PR buddies and being the bearer of fun, tiny, yummy things. Plus, I do still feel like a rock star in my white chef’s coat, which was a hit with my friends. They could have told me about the hair, though, which I later found to be sticking out wildly from my too-small hat. I told one of my chef instructors during setup that, although I didn’t think I wanted to do catering, it’s growing on me. The events are exhausting, especially one of this size, but exhilarating at the same time. After a nice, hot bath, I may be up for another event. Just don’t ask me for another month or two. Oh, sweetheart, I wasn't making fun of you ;) I was excited about the crackers, too!!!!!!! Thank you for all your help. It's students like you who make a difference in the community. Thanks. ;) I had a blast!